“What do the millennials want from policy makers?” asked a group called Common Vision (CoVi) in their ‘Manifesto for Millennials’. Millennials are ‘young people’, who appear to have (uncharacteristically) turned out in droves in the 2017 General Election, and the vast majority of them appear to have voted Labour solely because of Jeremy Corbyn. It’s not too difficult to see why. He promised to abolish university tuition fees, reintroduce student grants and the Education Maintenance Allowance, cancel student debts, give free lunches to all schoolchildren, bestow a minimum wage of £10 an hour on all workers, and lower the voting age to 16. On top of all this, he’d pour £billions into state schools and £billions more into the NHS, create four new bank holidays, build a million new houses and guarantee a “decent job” for all for life. What’s not to like? It may have been La La Land economics, but who cares? He said things could be done differently, and the idealistic youth believed him. He said things would get better, and they trusted him. It’s the wealthy bankers and posh elites who should pay the country’s debts, not pensioners, the disabled, or impoverished teachers and nurses who haven’t had a real-terms pay increase in a decade. Theresa May, by contrast, offered a social care policy which would have robbed dementia-suffering grannies of their life savings, deprived them of heating allowances in the bleak midwinter, and cut their already-meagre state pensions by removing the triple-lock. On top of this, she’d kill all those cute and cuddly foxes by bringing back hunting with hounds. Foxes and old people. She might as well have signed Toto’s death warrant. Young voters are by no means unthinking or univocal, but when Labour lavishes lollypops and the Tories promise a dose of castor oil “for your own good”, you can hardly blame them for succumbing to temptation – especially if they’re struggling with debt at university or watching their parents and grandparents sink into despair and shame at the local foodbank. 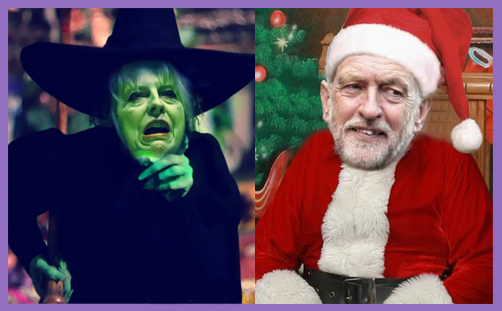 In the race to be the preeminent personality cult, the Wicked Witch of the West is simply never going to win against Santa, and Jeremy Corbyn’s genial authenticity beat Theresa May’s aloof authoritarianism hands down. While Corbyn was smiling over his jolly white beard and handing out free mince pies to the nation, May just delivered didactic lectures and refused to mingle with the lower orders. By declining to debate with Father Christmas, it became easy for youngsters to believe that the hollow witch preferred to stay in her lair, dividing the yew and spruce from the holly and oak, counting her skulls and gazing at a star quartz crystal, plotting who she could next bash with her broomstick. Theresa May lost her ‘strong and stable’ majority for want of 1,688 votes. Jeremy Corbyn was just 2,227 votes short of becoming Prime Minister, leading a ‘coalition of chaos’ with the SNP, LibDems, Plaid Cymru, solitary Green (and, oh yes, the DUP). He fell woefully short of winning an overall majority, but that doesn’t seem to matter: the post-truth era isn’t overly concerned with how Santa gets down the chimney when the house doesn’t have a fireplace. It’s just ho-ho-ho and a glass of sherry while Rudolph munches a carrot. Every day can be Christmas day. But the Witch cackles and eats puppies on toast. Or foxes. Either way, it’s always a nasty day under the Tories. And so Corbyn is the victor of the 2017 General Election despite losing, and May is the loser despite winning. What can the Conservatives learn from this? Well, they probably won’t. That’s part of the problem, if not the whole of it. CCHQ is full of arrogant apparatchiks who despise ordinary party members and think fractious minds can be placated with a surfeit of crass personalised emails. The Conservative Party needs to be opened up and returned to its members: the Chairman needs to be elected and made accountable to them, instead of to the Office of the Leader. The Candidates’ Department needs to return to what it used to be: a genial mechanism for discerning the mad, bad and sad; not a totalitarian garrison sifting out social conservatives and engineering constituency selections to ensure superficial diversity. But none of that will happen: all leaders like to have control – absolute, if possible. Perhaps more importantly, it’s important for the Conservative Party to learn that it has fundamentally lost touch with young people in a way which appears to be irreparable, with inevitable consequences for future elections. Port-swilling university Conservative associations and the geeky ‘Conservative Future’ are a world apart from the compassionate priorities and caring hearts of the millennials. Like it or not, they are overwhelmingly socially liberal. Justified or not, they frustrated and angered by feelings of impotence. For every lukewarm sermon Theresa May preached about the imperative of strength and stability, these youngsters had in mind the teenage anorexic girl who almost died for want of specialist bed, which when it was found was hundreds of miles from the family home, compounding stress upon suicidal stress. Even if the brightest Conservative brains now produced a manifesto which offered lollypops and Wonka bars, they simply wouldn’t be trusted: Conservatives are still the “nasty party”, and children have been taught to beware of Tories bearing gifts. Their teachers have done a sterling job, and the university lecturers an even better one. Theresa May is actually a warm, generous, charming and jocular woman. She is motherly, diffident and self-conscious, but she has the intuitive instincts of a nurse and minister, a carer and friend. But we never get to see that side of her. She still has a chance to redeem herself in the public eye, but it depends on her capacity for subtle self-transformation. Margaret Thatcher did it with the assistance of Laurence Olivier: Theresa May needs to learn not how to ‘act’, but how do draw naturally on those cheerful and charming qualities of character which she reserves for her husband Philip and the dog (does she still have one?). You don’t have to stand on stage with your legs three feet apart to project strength and stability: you find it from within at the centre-five vertebrae, and the natural stance and gait will follow. You don’t have talk in a robotic monotone to project power and authority: the voice is an orchestra, so sing a little; vary the notes. This isn’t ‘acting’: it is learning how to use to better effect what God has given you. When children are bombed at a Manchester concert or people stabbed on a London bridge, people take great comfort from the words of political leaders, but only if those words chime with a dimension of sincerity. Who doesn’t trust Father Christmas? Who does confide in a witch? You may quibble cerebrally over who had the better response after the recent atrocities, but the important thing is that young people felt they could trust Corbyn more than May. If there is to be progress, they need to believe that she feels what they feel: they do not want to hear formulaic revulsion and schoolma’amish instruction on the quality of policy and the excellence of the security services. They want emotional inspiration. It’s difficult for many Tories to grasp this point, but the age is much more concerned with feelings than facts: sensory perception has supplanted intellectual dissection. Theresa May is by character more conciliatory than divisive, but she is also more rigid and authoritarian than flexible and democratic. Millennials want to hear of creative commonality, compassion and shared values; she gives them crass Lynton Crosby soundbites and campaign speeches aimed at Ukip voters in Skegness. They care about sacked teachers and cuts to youth services; she harps on about the need to cut the deficit and reduce the national debt. Have you seen how much it now costs to rent a flat privately? Have you considered how much young people now have to save before they can get on the housing ladder? How do you save for a £20k deposit when your monthly surplus in barely £50? O, it’s all okay for the Tory toffs in their five-bedroomed million-pound mansions with sprawling gardens and endless hours for golf. But it’s tough, very tough, for thousands of families crammed into two-bedroomed flats whose only garden is a spider plant on the window ledge and a great day out is a visit to the foodbank. Jeremy Corbyn has tapped into this anger, and it is a real, seething fury. Theresa May might not be personally to blame, but she’s a very convenient Tory face into which you can shove a million middle fingers. From Peterborough to Bath, from Canterbury to Kensington, young people are now blasting out a very different tune. It is effervescent, optimistic and infectious. Theresa May needs to learn how to sing it. Urgently.